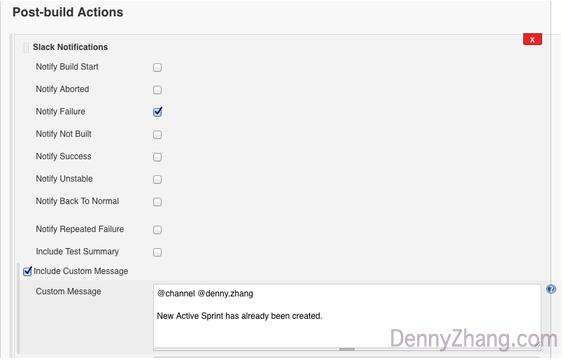 In this article, Denny Zhang explains how to set up Slack to give you notifications about new active Sprints. Read on to learn more! Following Git workflows, there is a branch called activesprint or develop. It is the release candidate. Most active branches should base on it. Teams need to be notified whenever a new activesprint branch has been created. To lower the communication effort, we can automate the detection process and get Slack notifications. For one, when a new active Sprint is created, we usually need to merge our private branches as soon as possible. The earlier we do the branch merge, the less merge effort we should expect. Secondly, config files might need to be updated accordingly (especially the bump version). We have two ways: push or poll. If we have the admin privilege of Git repo, we can define a Git hook. The hook subscribes to the Git branch to create an event. Or, we can define a crontab, which will periodically poll latest branch list of Git ls-remote –heads origin. Fortunately, activesprint usually has a strong naming convention (say sprint-37/sprint-38 or 1.37/1.38). Once we figure out latest branch list, we can easily detect whether a new activesprint branch has been created. Here comes a Jenkins job, MonitorNewActiveSprintin GitHub. We can also find a live version in our public demo on Jenkins. Whenever we detect a new activesprint, we fail the job and it sends out Slack notifications. Any improvements or suggestions? Share your experience!